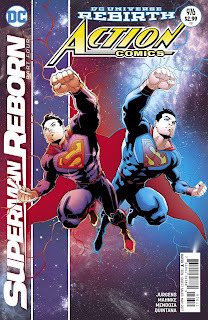 The Geektified Blog: Comic Book Review: Action Comics #976, "Superman Reborn, Pt. 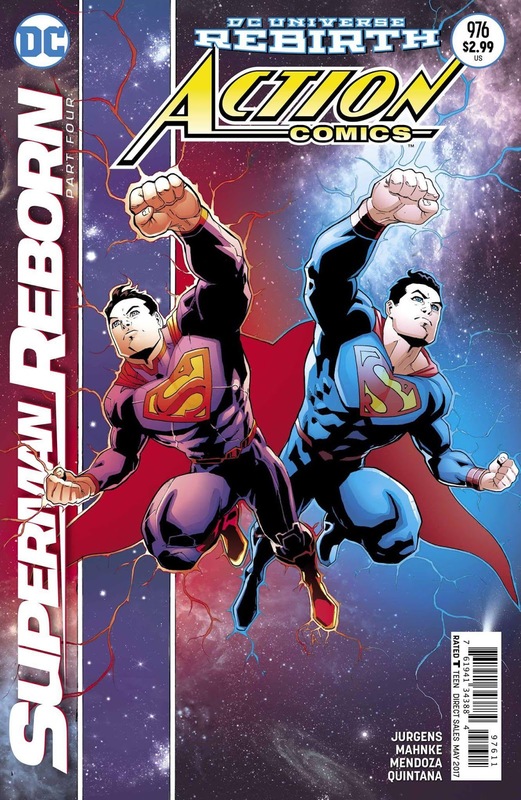 4"
Comic Book Review: Action Comics #976, "Superman Reborn, Pt. 4"
Superman isn’t what he used to be. You may not be aware, but there have been two versions of the mighty Kryptonian running around at the same time and neither one is said to be the real Superman. The same being said for Lois Lane. 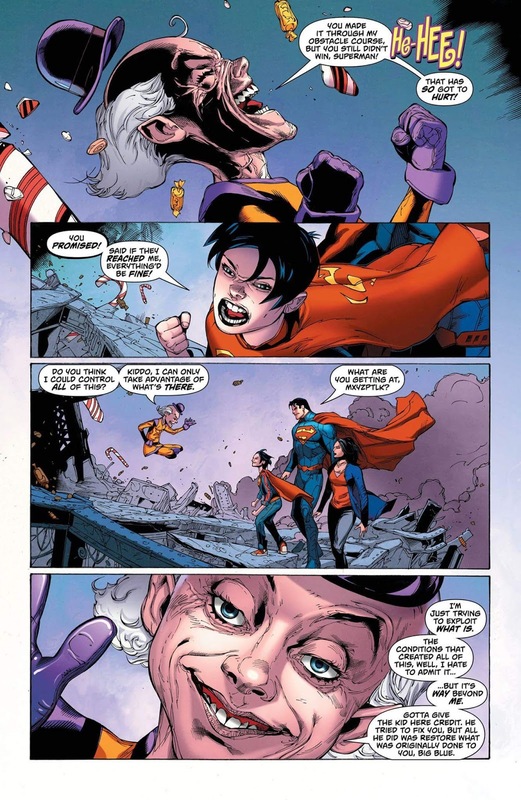 It may have been pretty confusing continuity-wise except for the fact of both New 52 versions of both Supes and Lois both died pretty much in the same manner. That left Rebirth Superman and Lois standing, along with their son, Jon. As long we’re on the subject of someone not being what they used to be, what about Clark Kent? Aren’t he and Superman supposed to be one in the same? Then why is a guy running around Metropolis calling himself Clark Kent and what is the mystery that surrounds him? Is he really who he says he is? Issue #976 is the conclusion of the “Superman Reborn” story arc, a crossover event spanning between the Action Comics and Superman titles. 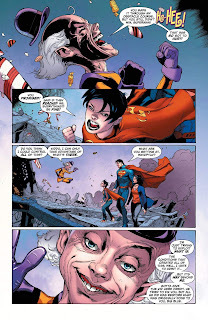 The story thus far, Clark Kent has been increasingly integrating himself into the lives of Superman, Lois and their son. Integrating so much, that it bordered on creepy. Then, Jon disappears into thin air, right in front of Superman’s and Lois’ eyes. Their search takes them to the apartment of Clark Kent, who, is not Clark Kent at all. It turns out to be one of Superman’s most iconic villains, if you can call him that. Doing his best impression of Harry Angel/Johnny Favorite from the movie, Angel Heart, Mr. Myxztplk, made himself into Clark Kent and put the whammy on himself to forget who he really was. No longer the 5th dimensional imp, he went about life as the bespectacled, mild-mannered reporter of the Daily Planet….but why? Now, what he does, is done in the name of revenge. Kidnapped by the mysterious hooded being known as Mr. Oz, he imprisoned Mr. Myxztplk, citing the reason precautionary. Not for what Mr. Myxztplk has done, but what he could do. He is chaos in the existence of Superman and for that , he is placed in a negative space prison, negating all of his powers. Not to worry though, he believed that Superman was his friend and once he realized that Mr. Myx was missing, he would scour the galaxy to find him…only he never came. Time is immaterial in the negative space, so who knows how long Myx was there? Angry and hurt, believing that Superman didn’t care about him, he escaped and to hide from Mr. Oz, turned himself into Superman’s alter ego. Once he began to remember who he was, he put his plan into motion, kidnapping Jonathan and making his parents forget about his existence. 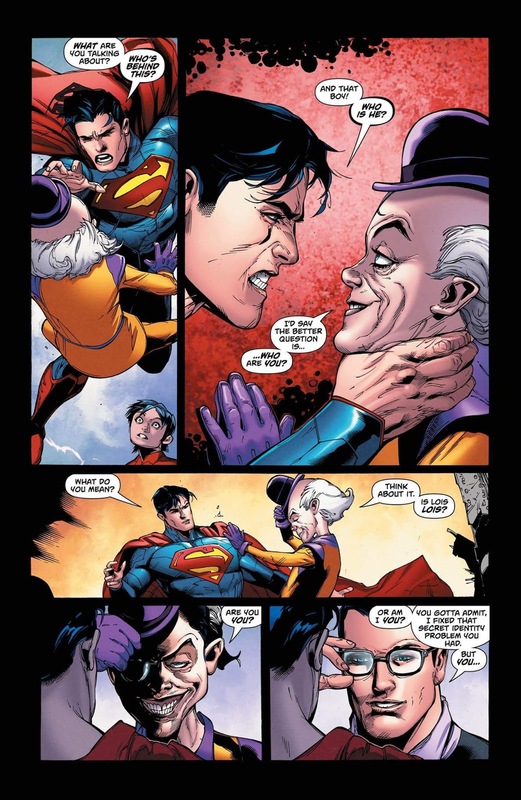 Superman is able to defeat Mr. Myxztplk ‘s games and find his son, he just doesn’t remember who he is. 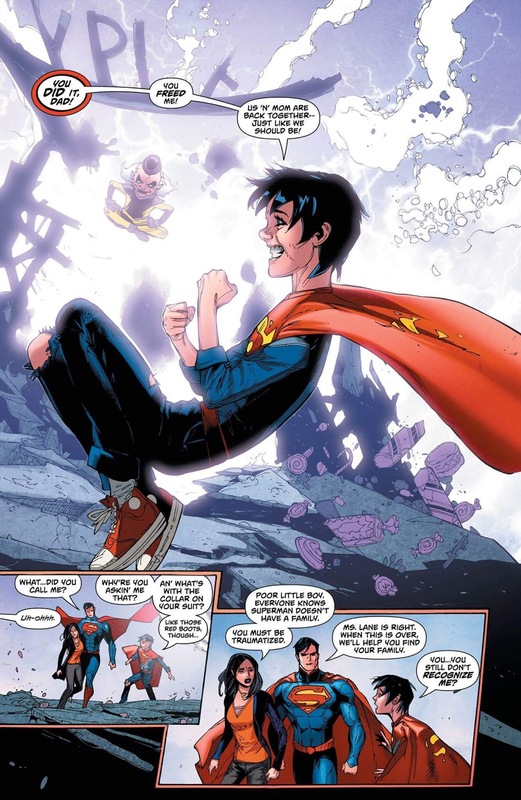 Now, in #976 of Action Comics, the conclusion of Superman Reborn, Superman continues his battle with Myxztplk, still unaware who this young boy is and why Myxztplk took him. 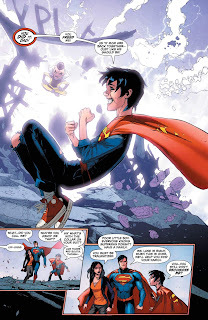 Will and how can Superman defeat a foe with magic powers bent on revenge? 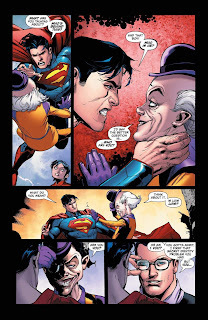 Can Lois and Superman remember what they have been made to forget? And who are those two ghostly figures that seem to be haunting this storyline? The issue ends as promised with a closing of the continuity gap left within the DC universe between the New 52, Flashpoint and Rebirth, with a surprising new revelation but also raising new questions for all other characters. all pointing towards the planet Mars. And we all know who resides there…watching…watching. If I am to give any spoilers away, it is only this…the issue ends as did the end of Watchmen #12. The Verdict: Obviously, if you’re a fan of Superman or you’ve been following this title, you cant miss this one! More importantly, there are questions answered as well as raised here concerning the growing mysteries of Rebirth. 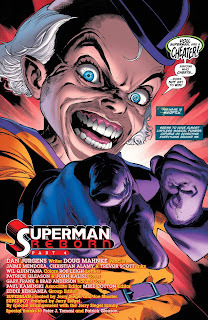 So, even if you’re not big on Superman, this is no doubt, a must read. It seems that some gaps are being filled concerning the possible new existence of all DC characters. Are they all is store for what has transpired here in Action Comics #976? This is an exciting piece of the puzzle that all began with Batman finding that certain smiley faced button in the wall of the Batcave. I really applaud the writing going on at DC and Dan Jurgens, who are crafting a new mythos to some of their most popular and revered characters. Even if you’re just coming on board to DC titles now, you’re in store for something wonderful, so sit back and enjoy the ride.